Easy to use within minutes of receiving it, our lapel microphone can be clipped directly to you - and then all you need to do is press play! High sound quality is the difference between amateur productions and professional ones. Our lavalier microphone is affordable, so it's easy to improve your production value right now! 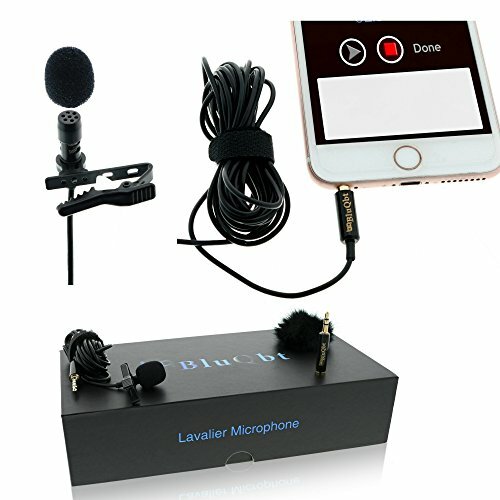 When you use a lavalier microphone for your vlogging, podcasts, livestream videos, YouTube etc., you ensure that you're getting the best sound quality possible - and without any of the extra noise you don't want. Record outdoors with black wind muff - included! Organize all of your equipment with zippered carrying case - included! The BluQbt lapel microphone utilizes anti-static noise reduction technology by creating 3 layers of shield around the 118 inches of cable wire included. PROFESSIONAL IPHONE STUDIO MICROPHONE provides high quality sound for recording live videos, vlogs, interviews, podcasts and more. Improve video and sound quality by 3X! Don't rely on manufacturer microphone for pro results. PLUG AND PLAY DESIGN gets you up and running within minutes. Easy to use, no battery required. Compatible with iPhones, Androids, and most smartphones, as well as cameras and computers. Get 360 degree sound and pro quality even while moving! NOISE REDUCTION TECHNOLOGY allows the BluQbt lavalier microphone to remove static and "hissing" sounds often heard with other microphones. Our wire has 3 shielded layers for superior noise protection and audio quality. RECORD OUTDOORS AND IN NOISY ENVIRONMENTS thanks to our lapel microphone's black fur wind muff. Reduce wind noise and other adverse environmental conditions by creating a protective chamber around your microphone. SUPER LONG CABLE allows you to move as needed while you're recording while still getting the best sound results. 118" of velcro-wrapped cable comes with each lavalier microphone. Order today and also receive a zippered carrying case! If you have any questions about this product by BluQbt, contact us by completing and submitting the form below. If you are looking for a specif part number, please include it with your message.